Assassin’s Creed is coming to virtual reality. The film, not the game. But not really the film? It’s all sort of confusing, just like every single one of these VR “experiments” by non-gaming companies. 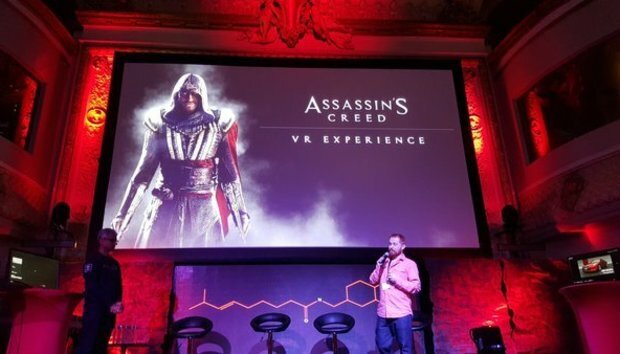 Last night, Fox took to the stage at AMD’s press conference to announce Assassin’s Creed VR Experience, a collaboration between the studio and its visual effects partner Practical Magic. We were told that it’s “not a game” and...well, that’s it really. Practical Magic’s Matthew Lewis said they’ve been working on the set of the upcoming film, 3D scanning the environments and “capturing the world of the film in painstaking detail,” from which I infer it’s probably a 360-degree film project or something in that vein. Don’t expect to perform a Leap of Faith off your couch. What we didn’t see: Any footage, or even a teaser. The promo image above is the sole proof of this project’s existence, and I’ll be steadfastly reserving judgment until I’ve seen whether this is a gimmicky tie-in or an actually-impressive VR experience. And Fox/Practical Magic/Ubisoft aren’t the only big names experimenting with virtual reality experiences, by the way. RoadToVR dug up a trailer for an experimental Star Wars game on Monday night (now mirrored by VRScout), subtitled Trials on Tatooine, which uses the HTC Vive’s motion controls for lightsaber battles. Basically, it sounds like a modern version of the game everyone wanted on the Wii ten years ago. Regardless of whether VR eventually takes off, this GDC’s certainly proving an interesting showcase for the technology.